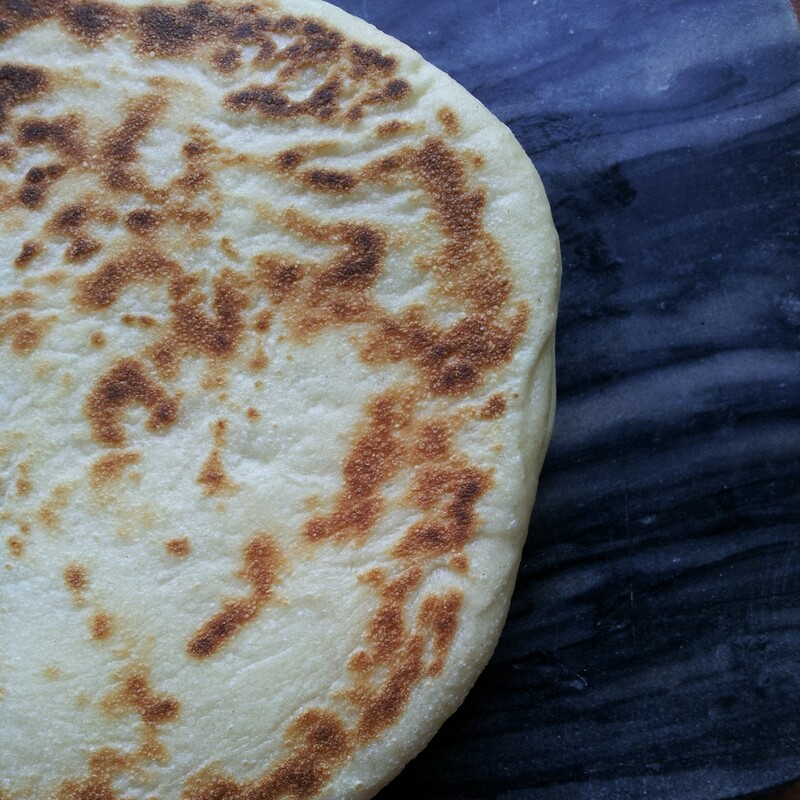 I’ve eaten quite a few flatbreads in my time. 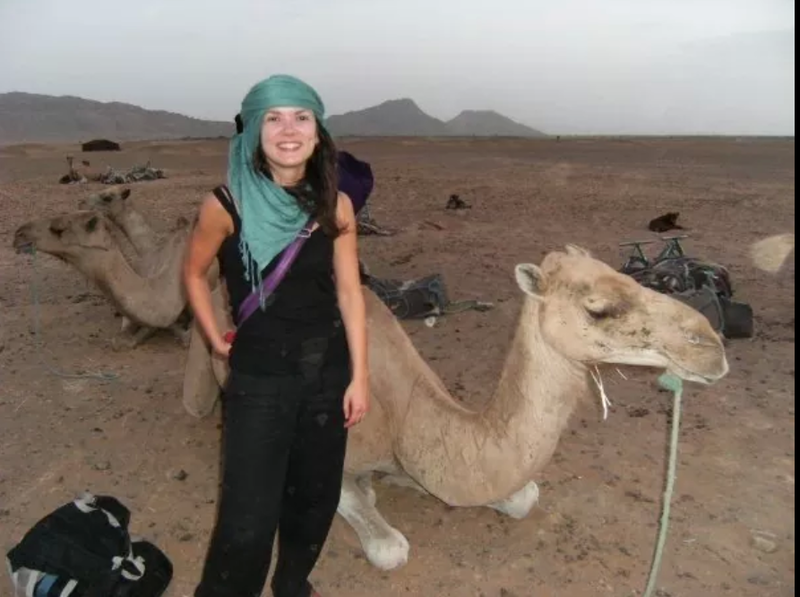 The most memorable being the fresh Moroccan breads purchased from a family’s converted front window along with a couple of mini bananas for essential sustenance for our 13 hour trek and overnight camp in the Sahara. I can still taste that soft fluffy white bread as I devoured it during the extreme heat wave washing it down in between swigs of proper sugary coke. The only thing that helped with the dehydration before we slept out under the stars on the hot sand. I’ve been searching for a recipe that could help me recreate that moment of sheer bread delight. The kind of delicious every day bread that meets every basic need. Versatility is one of it’s many virtues, it could be a meal in itself if required or the perfect accompaniment to any dish. This recipe originates from Turkey and is an absolute pleasure to make and eat. 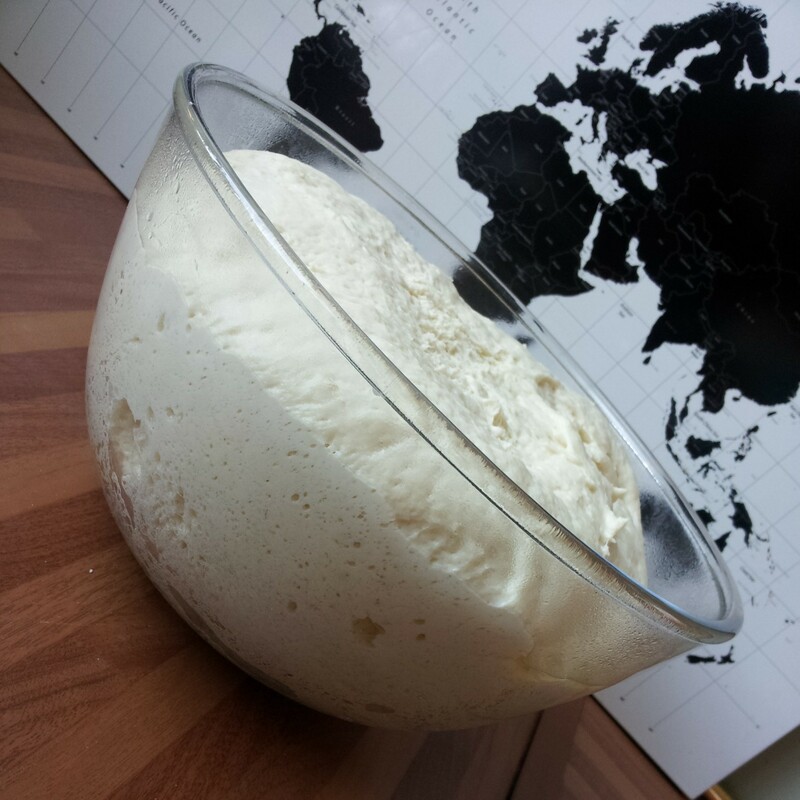 It’s an enriched dough with Greek yoghurt and oil which helps to retain it’s moisture so it keeps a little longer than it’s Moroccan counterpart which had to be eaten entirely on the first day, especially when it was over 50 degrees C most days! 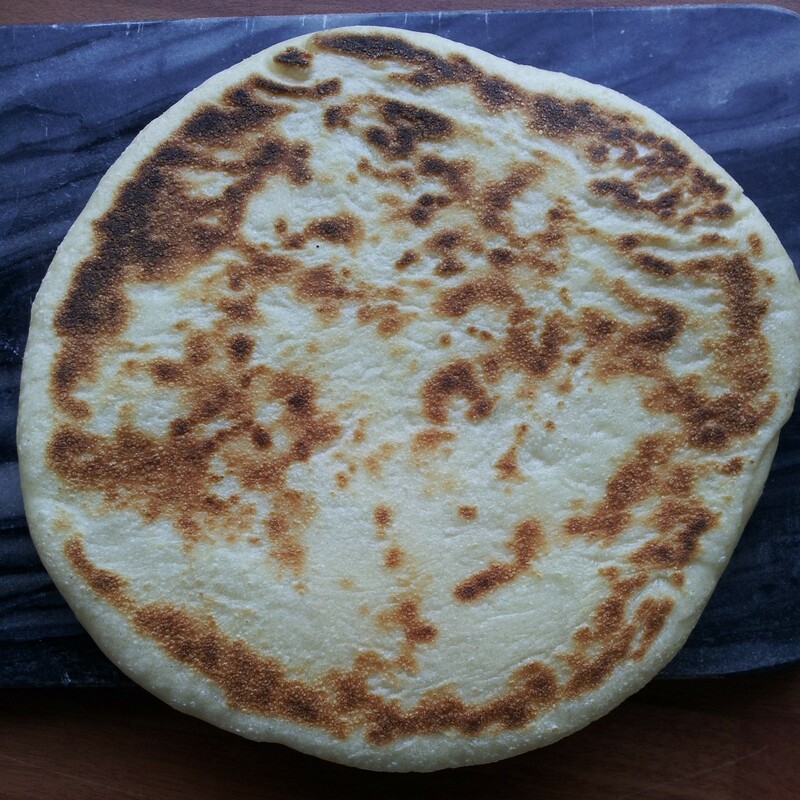 My previous attempts at flatbread making have been a bit hit and miss. (You will not find my hideous chapattis on here yet which were more like sofa cushions than delicate wholemeal wraps.) I blamed my pan, which has lost it’s non stick entirely and adds a beautiful dusting of metal to most dishes. I longed for cast iron cooking equipment and discovered a small cast iron frying pan in Oxfam for £3 which is a joy to use. It reaches temperatures that other pans a simply can’t maintain and needs only the tiniest drop of oil to prevent it sticking. Armed with this pan I intend to conquer flat breads once and for all. 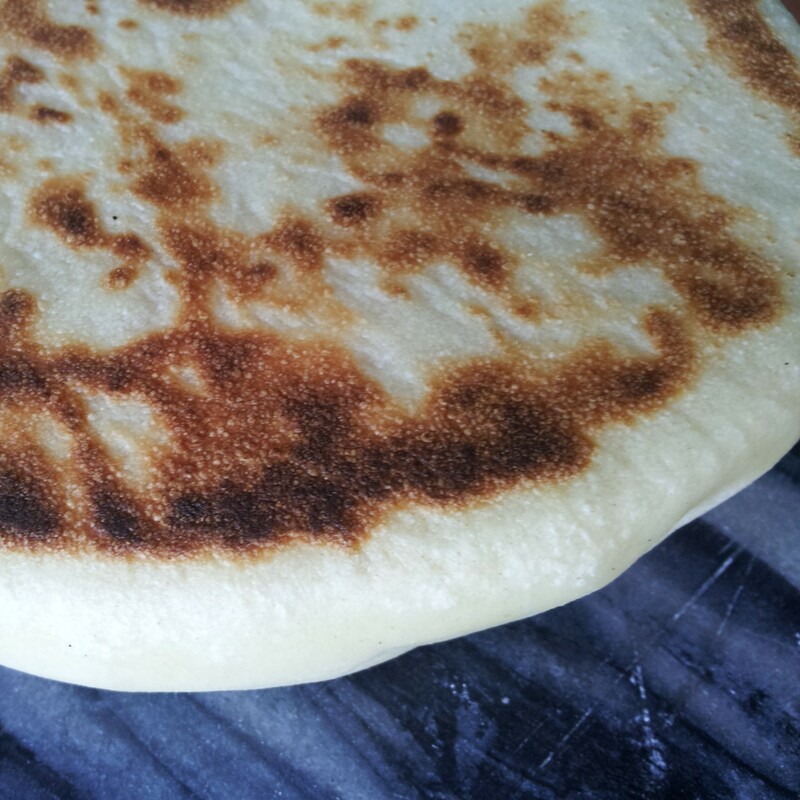 This recipe is enough for 6 – 8 hand sized small flat breads. 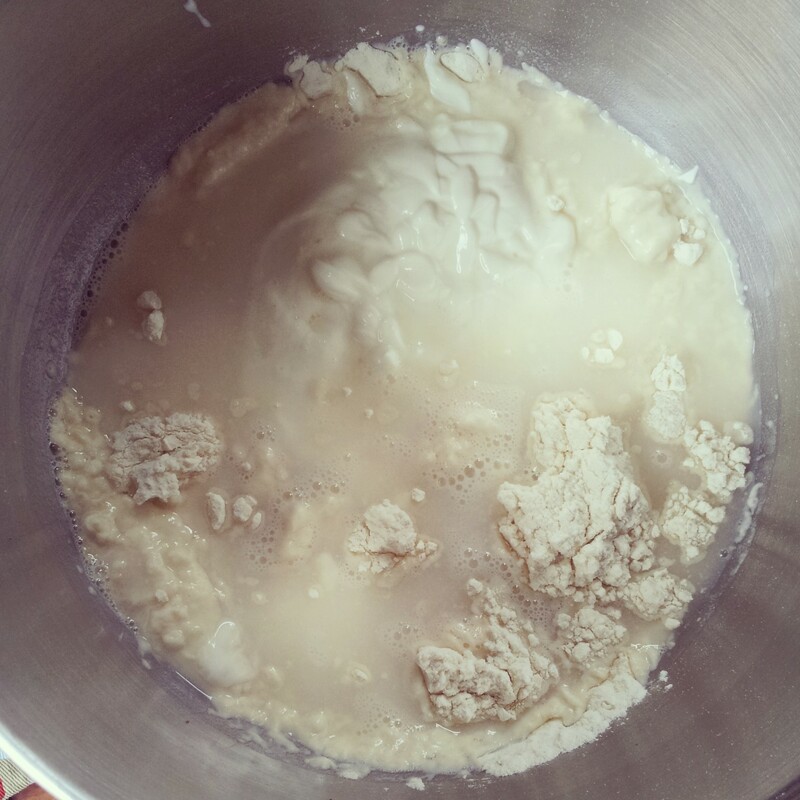 Mix all of the ingredients together into a shiny dough (keeping the salt away from the yeast). Knead the dough for about 10 minutes until smooth and springy. Then leave to prove at room temperature for 1 to 2 hours until at least doubled in size. 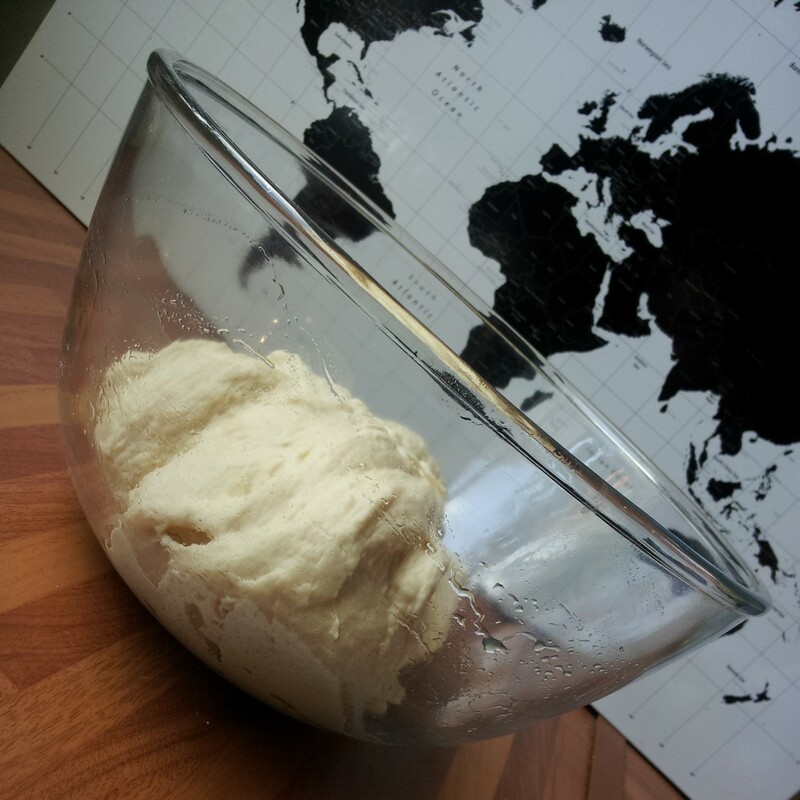 Knead the dough for about 10 minutes until smooth and springy. Then leave to prove at room temperature for 1 to 2 hours until at least doubled in size. 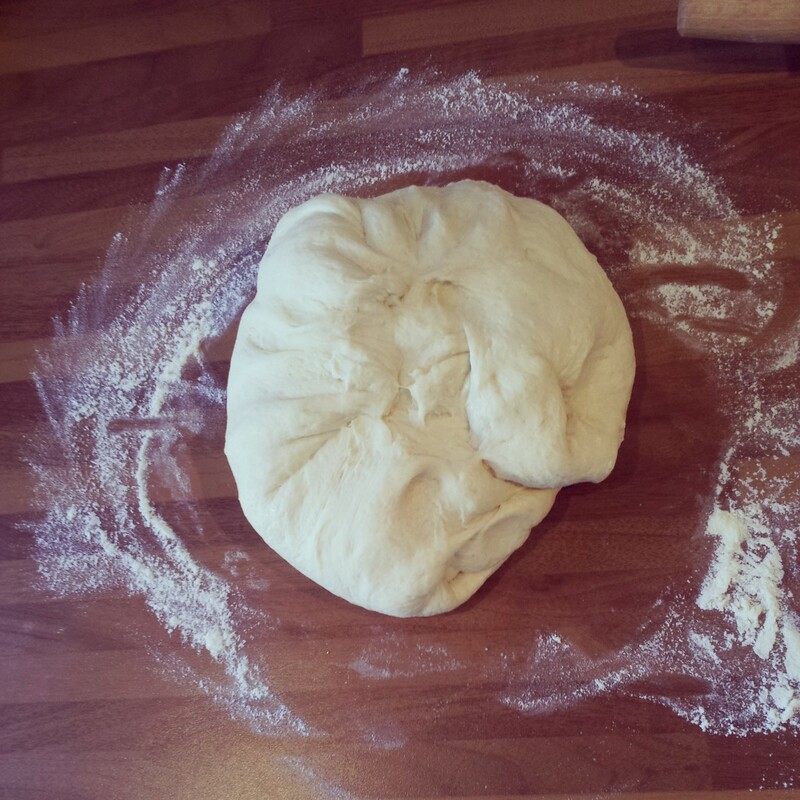 Knock the dough back and gently knead it on a lightly floured surface until it comes together in to a smooth ball. 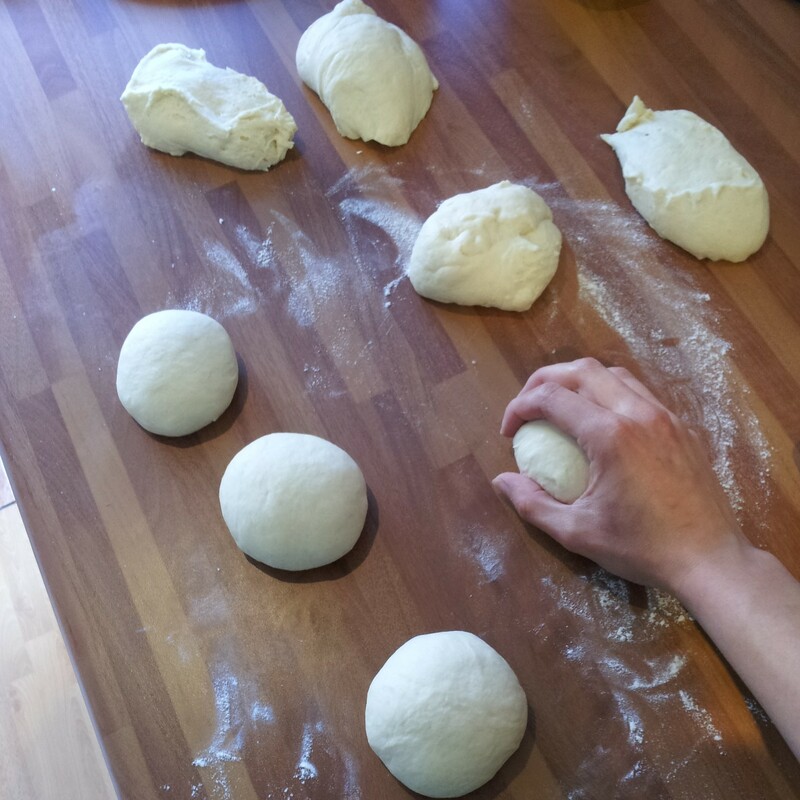 Divide the dough into 8 equal portions, shape into a ball and cover with greased cling film. 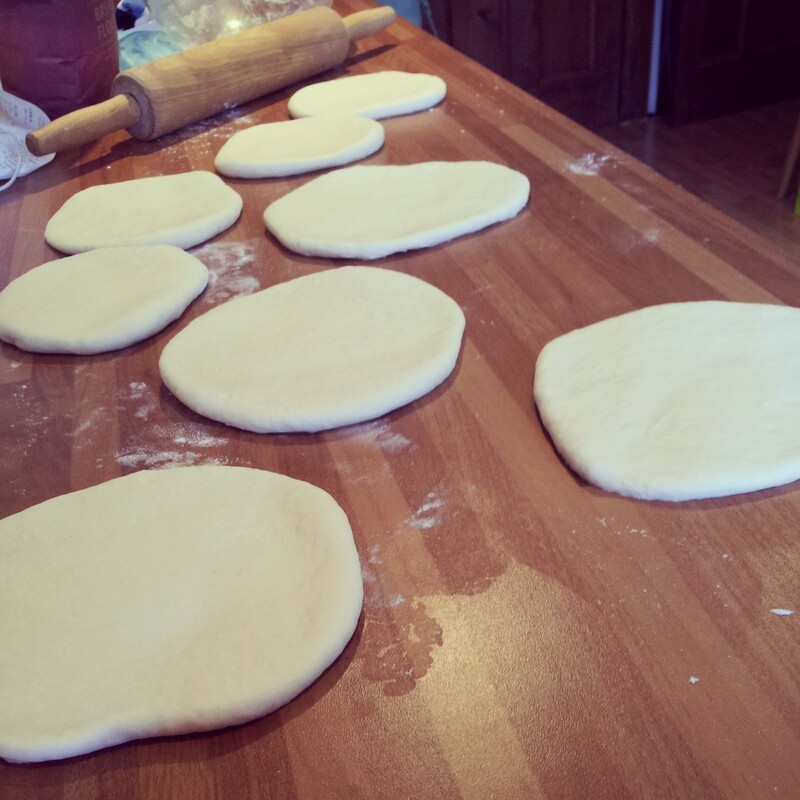 Flatten each dough ball out onto a lightly floured surface . 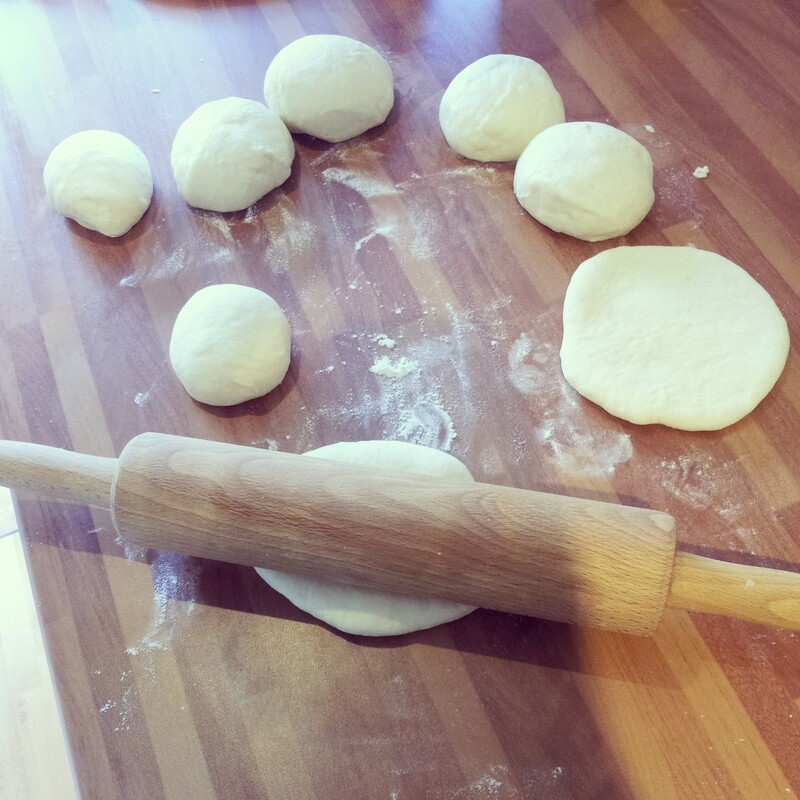 Using a rolling pin roll out each ball into a circle about 5mm thick. Cover again with greased cling film and leave to rest and prove for 15 mins, until puffed up slightly. You’ll see the yeast get to work pretty quickly when these are laid out in a warmish room. Whilst the dough awàits it’s final prove, heat the frying pan adding a splash of olive oil until sizzling hot. 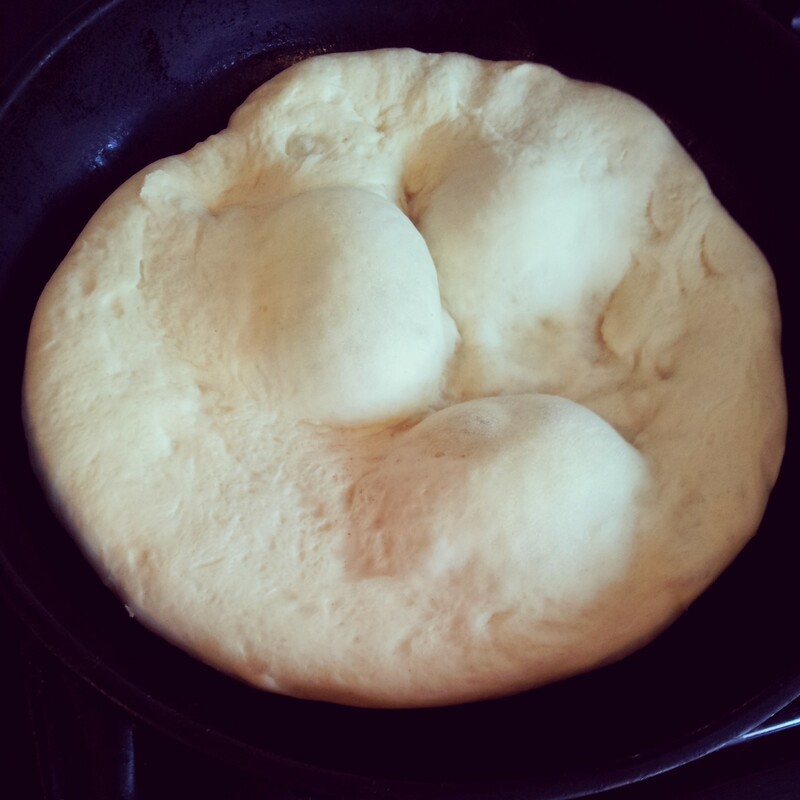 Gently place a proven circle of dough into the scalding hot pan. It will sizzle on impact, so watch out for any splashes oil. 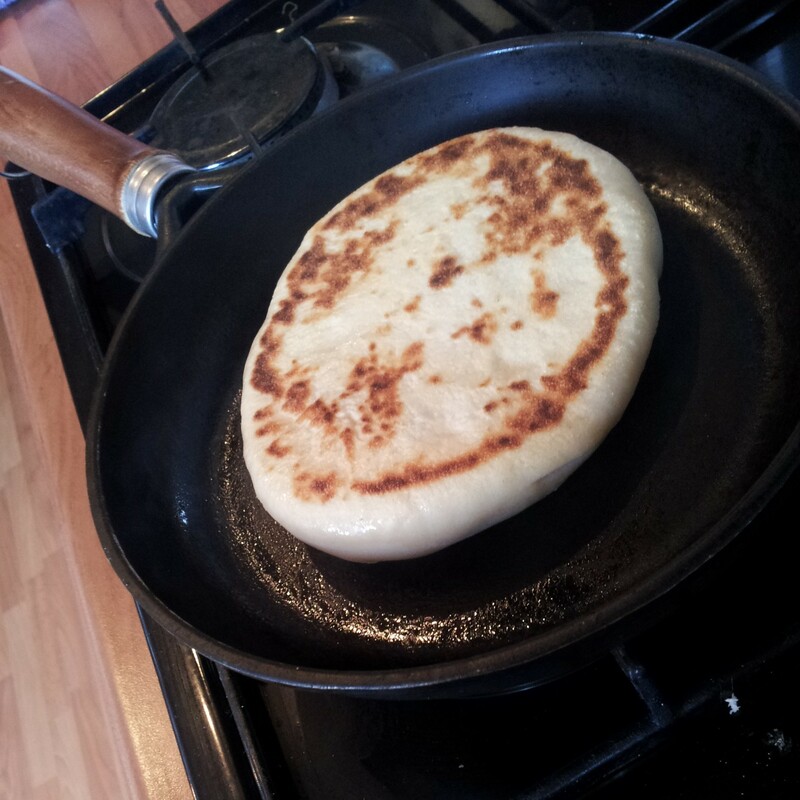 The Bazlama will puff up even further with the heat from the pan and bubble up in some places. Cook the Bazlama for one minute and flip it over and cook it for another minute on the other side. It should start to turn a golden brown and crisp slightly on the outside. 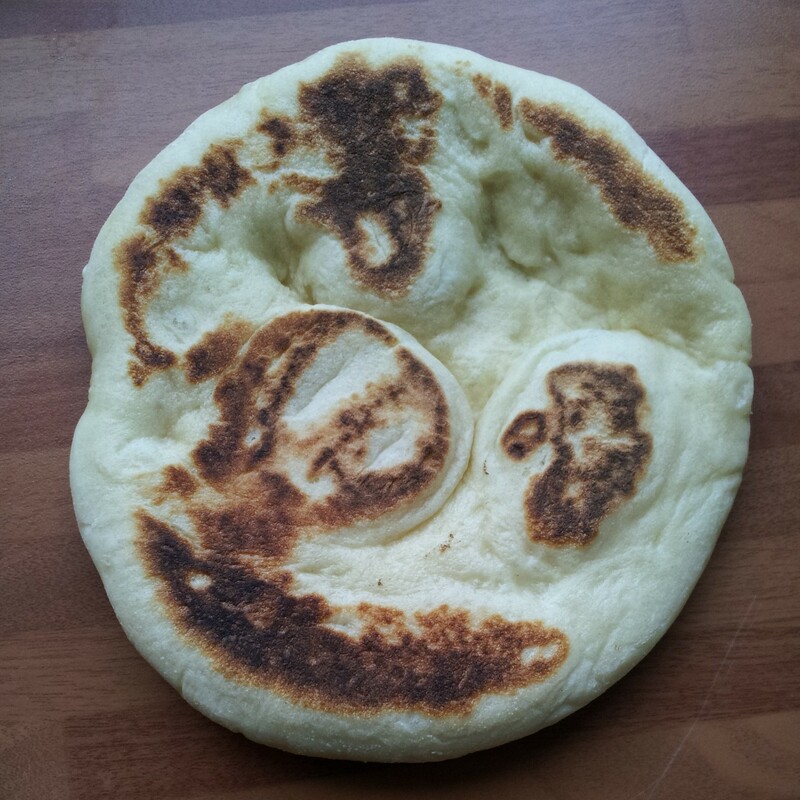 You may want to flip it over again to check that the Bazlama is cooked evenly all over and reached your desired degree of brownness. I like a slightly deeper colour on my breads to add to the flavour and texture. Once it’s cooked remove it from the pan and cover with a clean tea towel to keep it warm and soft. Repeat, until you’ve cooked all the Bazlamas! I love how each Bazlama takes on a slightly different charred pattern as it sizzles in the pan. The beauty of cooking in a cast iron pan means that if it starts to get too hot and you smell burning, just take the pan off the heat and it will continue to cook as the pan retains the heat. Once it’s cooled slightly you can safely return your pan to the heat to continue your cooking. Cooking one side at a time gives the Bazlama the opportunity to spring up fully as the yeast activates fully reacting to the intense heat. You can see how much your Bazlama rises in the pan. Check out that fluffy white mid section at last an inch thick! I adore Bazlamas. They have a wonderful chewy texture almost like a pretzel but much softer. Bazlamas are a perfect comforting addition to any meal or a meal in itself, as they are quite filling. 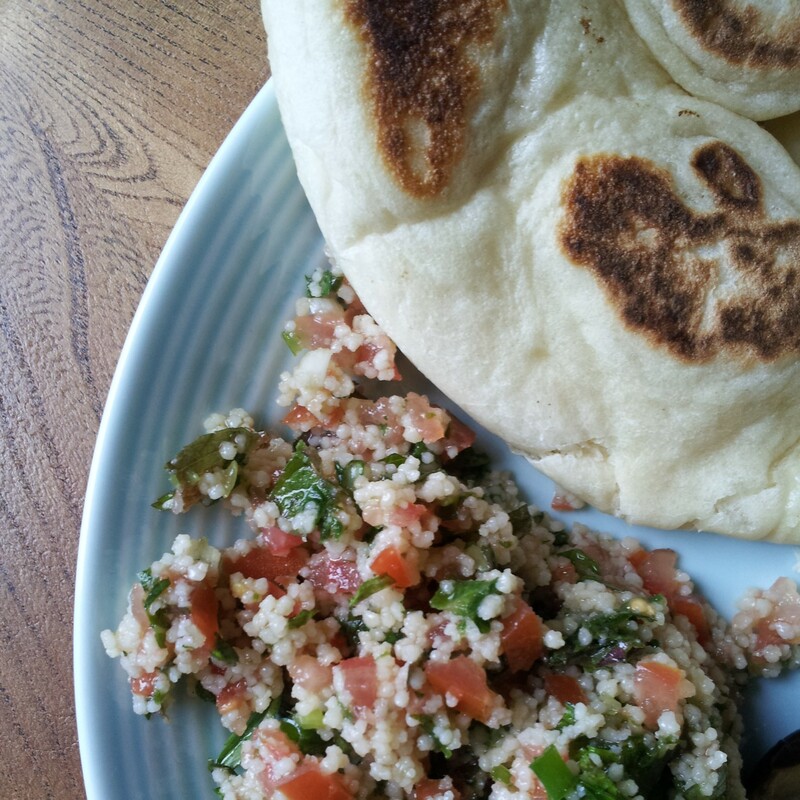 I served my Bazlamas with homemade Tabbouleh and hummus. Delicious! They’re best eaten warm from the pan, but they also freeze extremely well. I defrost them in the toaster on a low setting, as I prefer to eat them warm. However they also make an excellent portable lunch and have eaten many unadulterated Bazlamas straight from my handbag whilst on foot in between meetings. A Christening Cake with a history. 3 years on our final tier of wedding cake transformed.